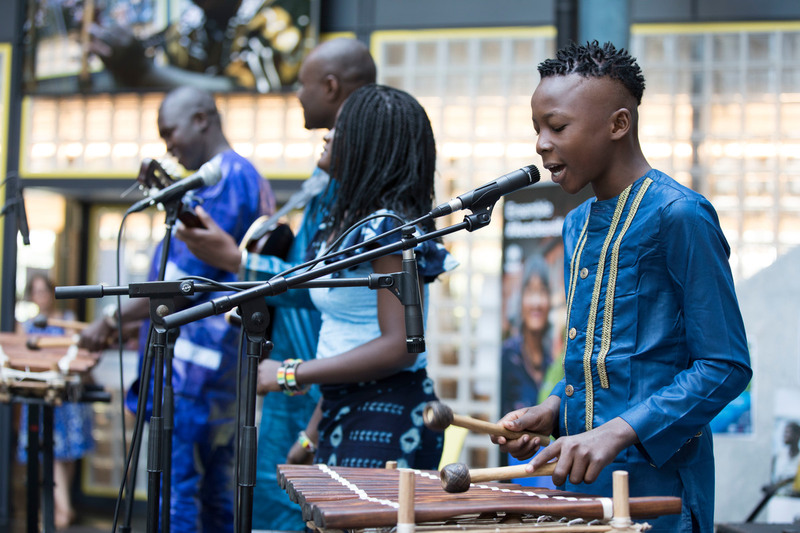 Fama Diabaté, youngest member of the Balaba Ensemble, opening Refugee Day commemoration ceremony at UNHCR Geneva on 20th June 2017. Geneva, Switzerland, 20 June 2017 – Malian artist and educator Fodé Lassana Diabaté, an artist on the Aga Khan Music Initiative (AKMI) roster, and three of his students who comprise the Balaba Ensemble, were the featured performers for the 2017 commemoration of World Refugee Day at the headquarters of the United Nations High Commission for Refugees (UNHCR) in Geneva today. The event follows the successful performance of AKMI’s Basel Rajoub and his Soriana Project for World Refugee Day in 2016. First marked in 2001, World Refugee Day is observed each year on 20 June to commemorate the “strength, courage, and perseverance of millions of refugees,” according to UNHCR, the UN Refugee Agency. Fodé Lassana Diabaté is part of the artist roster of the Aga Khan Music Initiative (AKMI), which supports musicians and music educators from 11 countries in Asia, Africa, and the Middle East in their efforts to preserve, revitalise and transmit their musical heritage to new generations of artists and audiences. In 2014, artist and educator, Lassana Diabaté, partnered with AKMI, to begin an arts and music education programme for school-age children in Bamako, within the framework of the “Jeudis Musicaux des Enfants” (Musical Thursdays for Children) project. This project, commissioned and curated by the AKMI, aims to provide traditional music education, as well regular performance opportunities at the Mali National Park, which was rehabilitated by the Aga Khan Trust for Culture. Fodé Lassana Diabaté is a virtuoso balafon (22-key xylophone) player. He was born into a well-known griot family and began playing balafon at the age of five. Diabaté has recorded with many of Mali’s top artists, such as Toumani Diabaté, Salif Keita, Babani Koné and Bassekou Kouyaté. He is the leader of Trio Da Kali, a brilliant performer, and a talented educator who represents AKMI’s arts education efforts in Mali. For the first tour of Switzerland, Lassana Diabaté formed the Balaba Ensemble with three of his most talented students. The first is a singer called Mariam “Né" Kouyaté. Originally from the region of Ségou, she is the niece of famous musician Bassékou Kouyaté. Raised within this prestigious family of griots, she mastered the traditional repertoire whilst bringing it her very own personal touch. The second is Fama Diabaté, who is also from one of the largest griot families in Mali. Fama Diabaté learned to sing by accompanying his mother at weddings and to play the balafon with his father. At the young age of 13, he already has an impressive artistic maturity. The third is Zoumana Diawara, who plays the kamélé n'goni, a traditional Malian harp-lute whose secrets he learned from his master Harouna Samaké. Zoumana is also a student at INA (National Institute of Arts in Bamako). For the commemoration of World Refugee Day, the Balaba Ensemble was joined by a distinguished and very special guest: Malian guitar virtuoso, Samba Diabaté. The Aga Khan Music Initiative (AKMI) supports musicianship and music making – both amateur and professional – for and within displaced communities. Though support for music and other forms of cultural expression is often viewed as a low priority in humanitarian assistance programmes for refugees, AKMI believes that art and music offer a unique resource that can sustain hope and provide an intangible yet indestructible link to cultural memory, which can eventually become the catalyst of cultural revitalisation.